The fast-paced play is a peek behind the curtain of life in the Hollywood fast lane. The show takes place in a suite at the classic hotel Chateau Marmont on the night of the Golden Globe Awards. What transpires is a bleak, tragic and unapologetically hilarious look at what the movers and shakers of Tinsel Town are willing and able to do in order to keep and preserve their secrets and the status quo of the Hollywood mystique and lifestyle. The show is directed by John Ferry, with Dennis Lyzniak as the production manager. The cast is as follows:Jarrod “Hilly” Hilliard: Clint Archambault, Morgan Wright: Sandi Stock, Gage Holland: Chris D’Angelo, Travis: Roderick Randle, Estella: Marcela Paguaga. 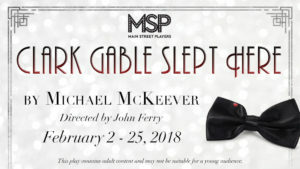 Michael McKeever’s plays include 37 Postcards, Suite Surrender, Charlie Cox Runs with Scissors, Stuff and Melt, and have been produced at Florida Stage (Manalapan), Marin Theatre Company (Marin County), Hudson Stage Company (New York), Phoenix Theatre (Indianapolis) and Caldwell Theatre Company (Boca Raton) among many others. His comedies have played in some of the most prestigious theaters in Europe, including Komödie Dresden (Dresden), Och-Teatr (Warsaw) and Theater in der Josefstadt, Kammerspiele (Vienna). He has been honored with an NEA Residency Grant (New Theatre, Miami) and has been a 3-time finalist for Humana Fest’s nationally renowned Heideman Award. He is the recipient of five Carbonell Awards; two Silver Palm Awards; and three Florida Individual Artist Fellowships. He is also an award-winning actor and designer. He is a founding member of the award-winning theatre Zoetic Stage in Miami. He resides in South Florida and is a member of the Dramatists Guild and Actors’ Equity.